With Wolf blowing fire and swinging his axe and club during the concert!! Where's the scandal? 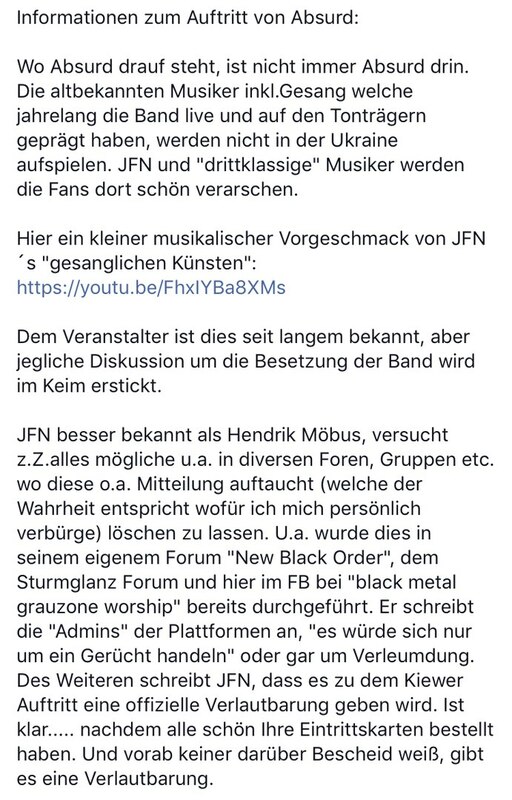 That Jens "Asemit" Fröhlich (Ewiges Eis, Methorn), who never was part of Absurd to begin with, keeps spamming the internet with his fake news? He speaks for no one but himself. There's a public statement on the official website of the band, but as always you have someone butthurt who wasn't invited to the party. Tough luck! So that's just some unrelated person bitching that "new Absurd" in not "the trve one"? Makes even more funny. However, it's well-known that there cannot be "bad" PR, so it's quite questionable if that may do any harm. So that's just some unrelated person bitching that "new Absurd" in not "the trve one"? That's the nutshell of it, yes. Quite amazed to see that Absurd will have a totally different line up. Just wait and see how it will all go (down in history) in Kiew. Some will probably like it, others surely won't. However, it will be Absurd for sure. 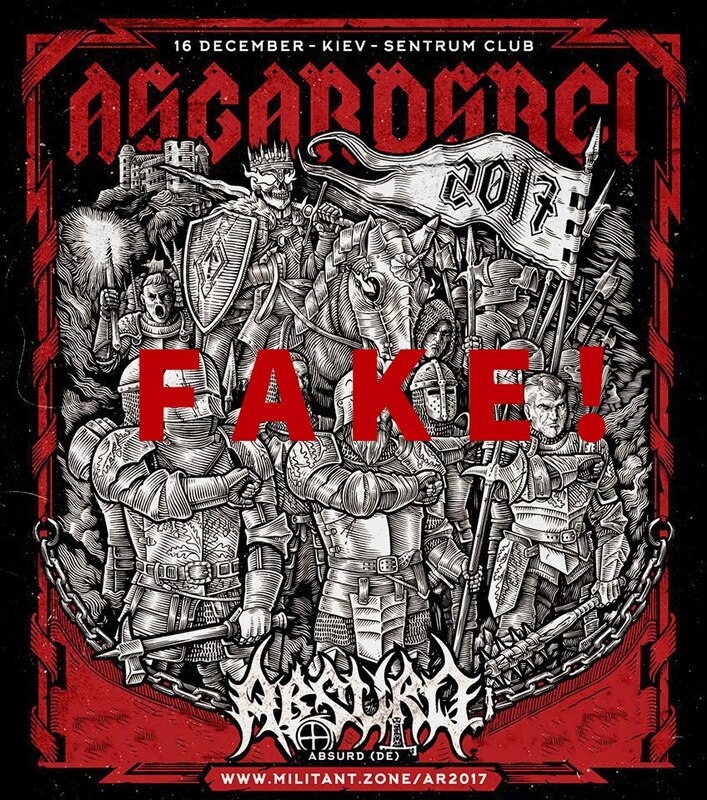 Right on the moment when I checked the hordeabsurd.com announcement about the line-up it was very obvious that like Absurd has always, they will continue to divide opinions. Sometimes even quite aggressively. Not many bands are capable to be in such situation. Peste Noire / Absurd split, announced in Peste Noire interview, will be a new recording in new line up? Having seen the former line-up in 2008, i'm down for seeing a different incarnation of Absurd. The 2008 one wasn't original either any way, as brilliant as they were. Should be interesting at least, and the Asgardsrei EP in it's entirety can't fail much. Would be nice to hear Germanien Über Alles with the original disco beat. Most offbeat and barbaric bass player i've ever seen, should fit the old Absurd material nicely. Looks like a slippery comeback. I would be curious to see this, but I regret never seeing the former line-up. Isn't it cold in Kiev in December? Like -10 or -20°C? This winter will be cold in Ukraine , so -10 not be surpise. A former session member being unhappy because his services aren't needed anymore calls out a founding member? Well, he never was a part of this band, to begin with. Maybe he actually did perform some background vocals live on stage, once upon a time, but that's it. thanks for your Mail. I hate JewFN and MERCHANT OF DEATH. JFN is a Traitor. I have only interested on Vetche CD?s. JFN he abuses this name, he is not ABSURD ! ABSURD is only WOLF and UNHOLD !!! Best Greetings from Germany - SMASH JewFN / SAVE ABSURD !! !